This CD, which arrived in the package that M. sent me a couple months back, is one of the oldest that I still have: I bought this in high school. It was, I’m fairly certain, used: CD prices then were exorbitantly high for high school students. I’m not sure when I would have bought it: summer 1994, maybe. I’m not sure where I would have bought it: probably a used CD store in Rockford? I remember bits of this (“Crest”) going through my head when I was working as a banquet server/busboy, which would have been my senior year of high school. This was probably the first Stereolab CD I bought – there’s the off chance that I bought Mars Audiac Quintet, from 1994, first, though I didn’t like that one as much as this one & sold it at some point. (Later I reconsidered this; I think I may have bought Mars Audiac Quintet three separate times, but I don’t remember what would have happened to make that be the case; in any case, I don’t think that I still have a copy.) Mars Audiac Quintet would have been in Spin or The Onion or whatever I was reading then to get ideas about music, but I liked Transient Random-Noise Bursts enough that I never sold it. 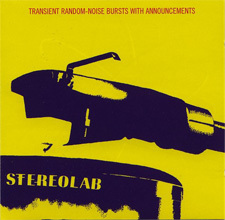 Stereolab’s been around for so long now – this CD is almost old enough to buy cigarettes! – that it’s hard to remember how strange they seemed at first: the constructivist red and yellow gear on the CD, the back cover text that seemed like it was from some weird hi-fi 1950s, the “æ” in Laetitia Sadier’s name, the tagline “Art is a science having more than seven variables,” ready for scribbling on desks. The front-cover graphic, a stylus on a record, abstracted almost to the point of being unrecognizable: certainly at that point I wasn’t attuned to design, but I knew that this didn’t look like anything else I was used to seeing. The booklet was also puzzling: photographs of electrical machinery that looked like it was from the 1950s with what look like JPEG-style graininess before the fact, and sample credits to people I’d never heard of but who would quickly become hipster touchstones. Significant of the forbidden is transgressed in eroticism. Now one thinks “oh, Bataille,” but then it was hard to know what to make of that: Sadier’s voice was lovely, the English was choppy, one wondered what their being Marxists meant. There were not any Marxists in rural Illinois. It did sound nice, though. Now I understand why “Pause” is described as “Proust song” (“Retrieve the past / like a prayer / Bringing it back / Into the light”); at the time, this reference, like most of the others (“Ondioline,” “One Note Samba,” Gershon Kingsley, “Farfisa”), was opaque, something that might be tracked down. Wikipedia makes listening to this CD very different. There’s a brutal drive to many of the songs on this album (the ends of “Golden Ball” and “Analogue Rock,” the entirety of “Crest”), and I think that’s what I responded to first: there’s an easy appeal to it. And of course the centerpiece of the album, the 18-minute “Jenny Ondioline”: there’s the same drive, the feeling that something could go on and on, which was very strange to someone whose idea of a long song was “Free Bird,” frequently played entire on the local classic rock station. The lyrics of that weren’t printed on the back; partially buried under the wall of sound, you can make out something about not caring if the Fascists have won, socialism still needs to build. It’s political, but the political sense comes as much from the drive of the music as it does from the lyrics. It winds down about seven minutes in, then starts back up again, without vocals, with more guitar. Vocals return: “take heed and lift up the struggle,” but again it’s hard to make out exactly what’s being sung. My politics when I was in high school were nothing if not incoherent, but there was something viscerally appealing about this. So much of my drive during high school was essentially reactionary, concentrating on leaving, being anywhere but where I was: this fit in perfectly. I don’t tend to like long songs, but this could go on forever: it’s that perfect. For my college interview, I was asked to list three significant books; I put down something by Salinger, One Hundred Years of Solitude, and Bernardo Atxaga’s Obabakoak, at the time, I thought, the only Basque novel, which I found at the public library. In my interview, I talked about that book at length – nobody, of course, wants to hear a 17-year-old describe Salinger. In retrospect, I suspect that book had a lot to do with my getting into college: I’d found something strange, and I’d made it my own. Stereolab – especially this record – fits into the same category: an entryway. After arriving at college, I dutifully tracked down the rest of Atxaga’s work, and bought his new material when it came out; but it never had the same resonance for me. It’s hard for me to say if I ever loved Stereolab. They were too hard to pin down: you could get what Pavement was about without too much trouble, for example, but Stereolab was a little too exotic, seeming to operate in some other plane entirely. I still like Stereolab, though, and dutifully buy their new records when I come across them; when finally I didn’t buy Sound Dust, I felt decidedly guilty. That was, of course, a mistake. Ordered by play count, only one track per artist, limited to one hour. iTunes evidently started recording date added to its metadata in October 2003, so the accuracy of this is limited.